Important: Arrival flights must be before 10pm (no exceptions) to San Jose and departure flight should be after 1pm. And arrivals/departures only Mondays to Thursdays, Not Saturday or Sunday. Minimum Age: 12 to 16 yrs if traveling with parents. Families welcome all ages. Mandatory: 17 yrs must get escorted to the program by our staff, it's US$200 extra, round trip (if traveling without parents). Airport pick up. Project orientation and first night spent in San Jose. 6 days a week work shifts. Morning and late night volunteer shifts including night patrols. This park is the most important area in the entire west half of the Caribbean for the nesting of the green turtle. 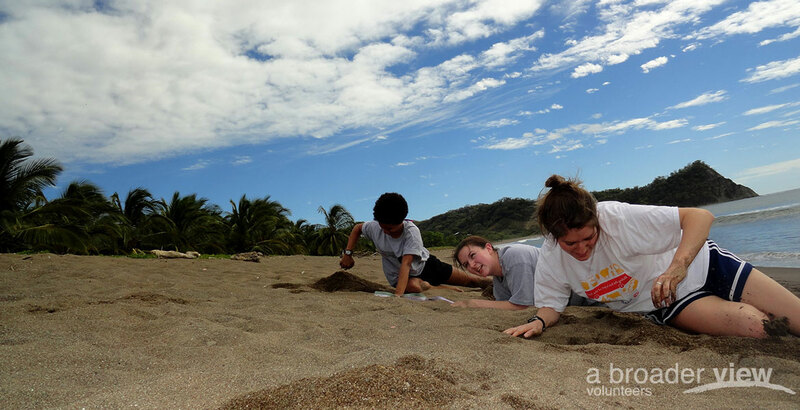 Volunteers participate on the sea turtle preservation including monitoring and registering nesting patterns, record keeping of eggs, moving eggs to the hatchery, beach patrols, freeing of the newborns to the ocean. Experience not required, but anticipate strange work hours (middle of the night!) and lots of time spent on the beach. Our projects are open to students studying; or those with a keen interest, biology, marine life, animal welfare and conservation efforts around the World. Volunteering in the National Parks of Costa Rica help to solve some of the issues related to the lack of personnel and budget cutbacks that the Costa Rican's government has to face every year. We know that volunteers play a vital role in the conservation efforts: without outside assistance, these projects would be lost. Come join us and make a difference! School group projects can be arranged and customized including group tour leader, airport transfers, project placement, meals/accommodations and sightseeing trips. Please inquire about our Spring break and summer vacation programs. Discounts apply for groups of 5 or more traveling together. We can accommodate any project length. This program is located in Guanacaste, about 10 miles from the town of Samana. A very secluded location requires 4/4 vehicles and boats to access the program area. Volunteers participate on the sea turtle preservation including monitoring and registering nesting patterns, record keeping of eggs, moving eggs to the hatchery, beach patrols, freeing of the newborns to the ocean. Experience not required, but anticipate strange work hours (middle of the night!) and lots of time spent on the beach. Most national parks offer on-site shared volunteer accommodations. These living conditions are basic, but clean and comfortable. There is no electricity in the home. This is a secluded area and rustic cabins for living. Running water is available and communal outdoor washroom/showers. Meals are provided 3 times a day (breakfast, lunch and dinner) including beans, rice, grains, meat and vegetable. This is a rustic, adventure location and require people about o adapt to the basic conditions. A two week minimum program is requiered to a maximum of 6 weeks. Volunteers need to bring their own bedsheets/pillows. School group projects can be arranged and customized including group tour leader, airport transfers, project placement, meals / accommodations and sightseeing trips. Please inquire about our Spring break and summer vacation programs. Discounts apply for groups of 5 or more traveling together. We can accommodate any project length. Internship descriptions: With the collaboration of volunteers through internship projects we get the chance to continually improve the development of the investigation projects, pursuing conservation of resources in areas of biological importance in the Central American tropics. We need people who want to have a rewarding experience doing an internship or a gap year project on behalf of the natural resources of Costa Rica and the world. It is also a great opportunity to learn about the culture, language, food and hospitality of Costa Rica in the Latin American context. Apply knowledge in areas of natural sciences in terms of improving and supporting research activities in marine resource conservation in Costa Rica, fulfilling personal and professional academic requirements related to biodiversity conservation.